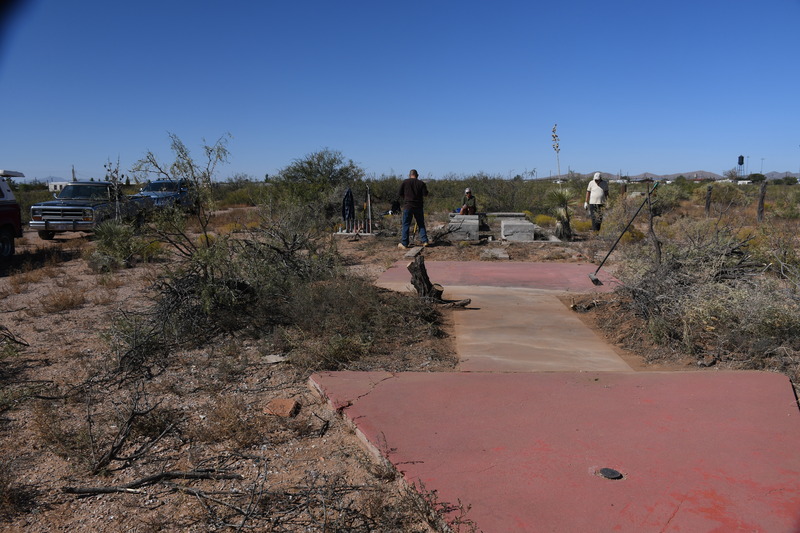 The resurrection of the previously obscured Airway Marker Arrow took a lot of hard work, but it was finally completed by long time Columbus FASF Members, Sheila Bjeletich, Don Farber, Mario Escudero, Gordon Taylor, Mike Florey, Airfield Security Chief, Bob Wright, and all the way from Las Cruces, esteemed FASF Airfield Site Chairman, the one and only, Bill Madden. 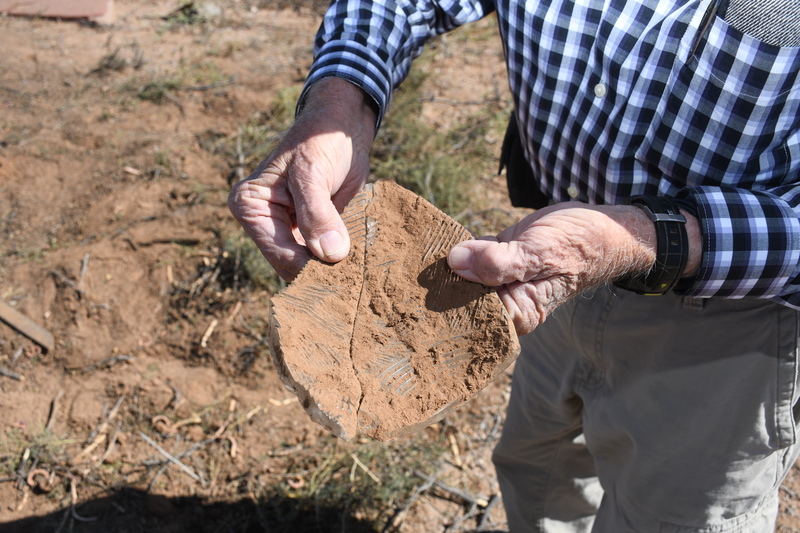 Bill’s Airfield Archeological Team is the one that has labored more than four years to locate the 1916 flight line’s precise position and orientation on the 1916 Airfield. 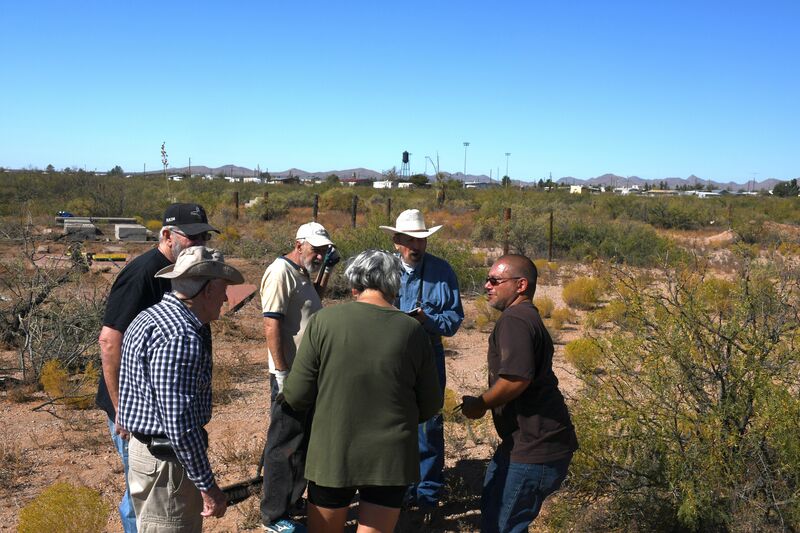 Below are some of the videos and still photographs taken by the FASF’s Videographer, Bob Wright, FASF Official Photographer, Mike Florey, and volunteer photographer, Sheila Bjeletich. This entire project ran through two months and took many days of labor on the site. All the below photos may be seen in high resolution and full-size by clicking on them. 1st Aero Squadron’s Airfield Sign facing Highway 9 in Columbus. The above short (2:21) drone video was taken during one of the volunteer work days by Airfield Security Chief, Bob Wright. At the bottom of this page’s post, you will find a longer (8:16) video taken during work days – on the ground – by Ric Lambart. Volunteer Workers take a break. 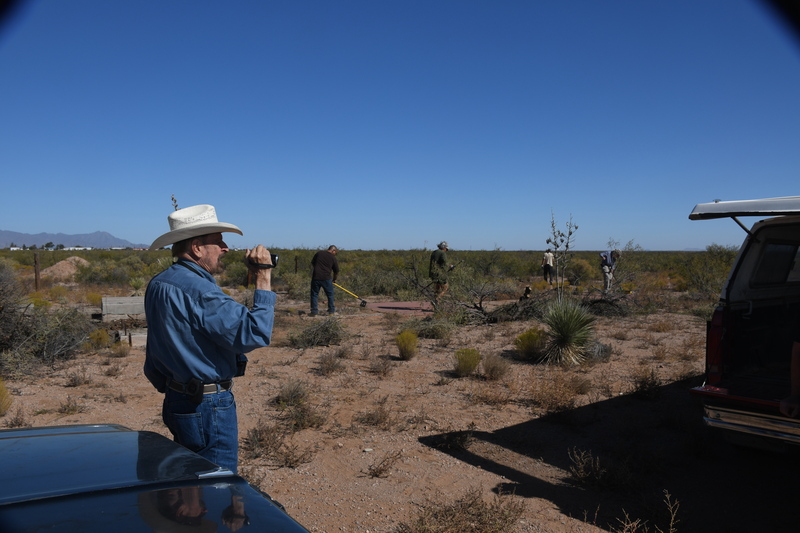 L to R: Mario Escudero, Sheila Bjeletich (Project Manager), Bob Wright (Airfield Security Chief and Drone Operator), Bill Madden (Aerodrome Site Chairman), and FASF Photographer, Mike Florey. Photo by Ric Lambart. 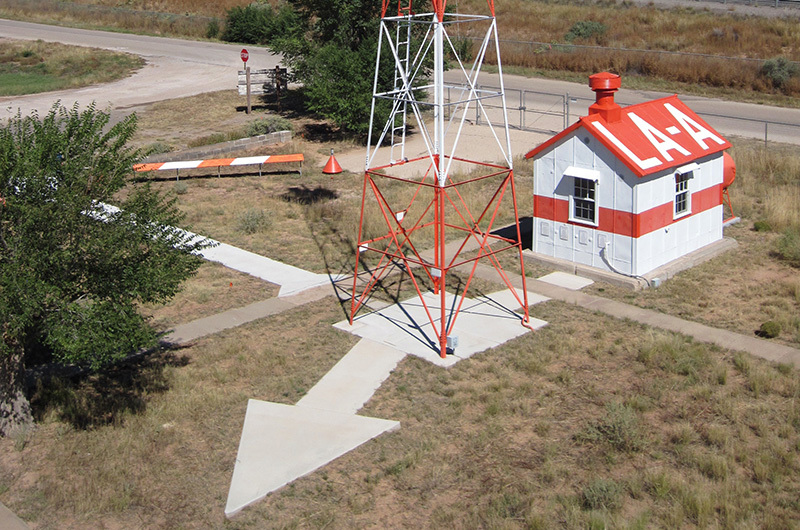 Photo of fully restored US Airmail Route CAA (now the FAA) Airway Marker and Power Shed at Grants-Milan Airport, NM. This familiar looking restoration was identified for us by Steve Owen, long time FASF member, who was part of the restoration team that accomplished the task you see in the above photo. 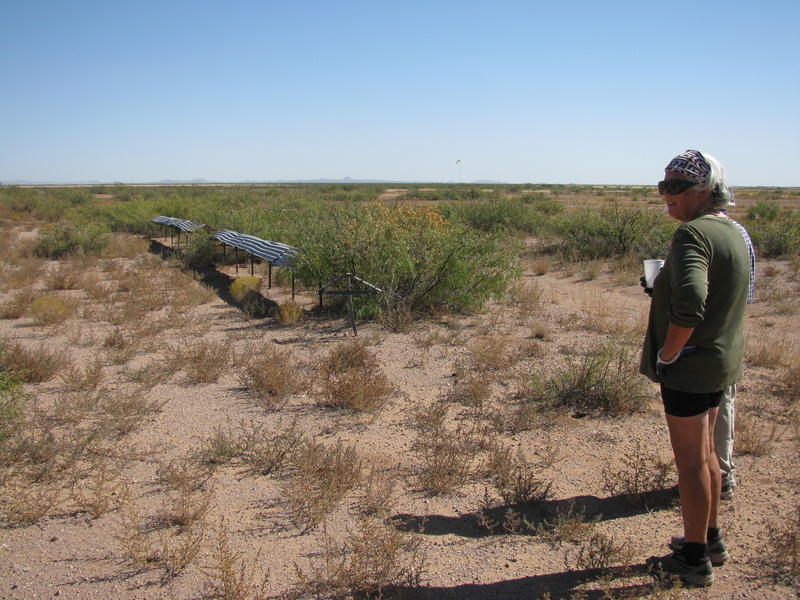 Milan is near Grants, NM and they are both West of Albuquerque, NM. 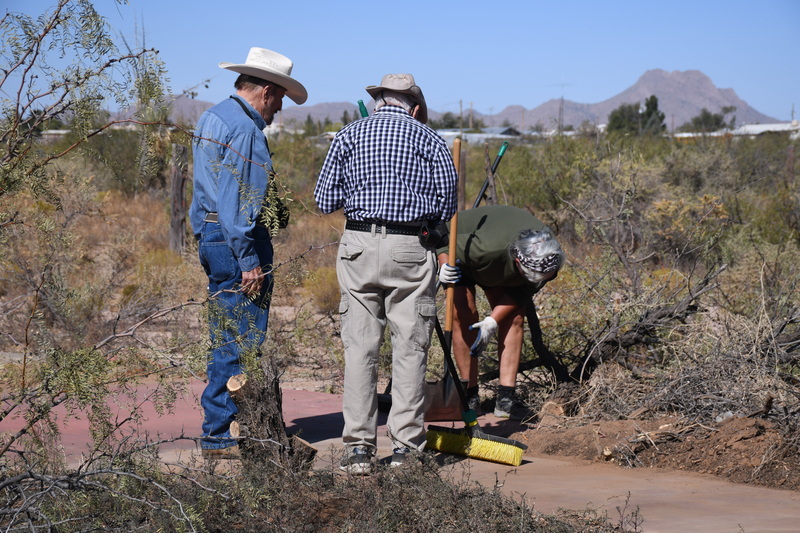 The impressive restoration project was organized and completed by the CCHS (Cibola County Historical Society). Steve has given our own group a lot us useful advice. Volunteer and Columbus City Councilman, Don Farber, discussing project with Sheila Bjeletich. 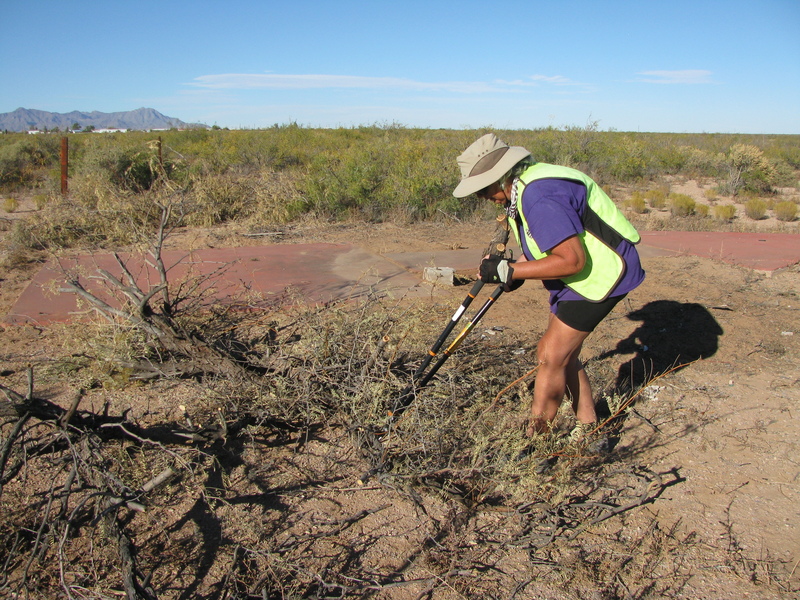 Sheila cutting Mesquite branches away from Airway Marker Arrow with loppers. 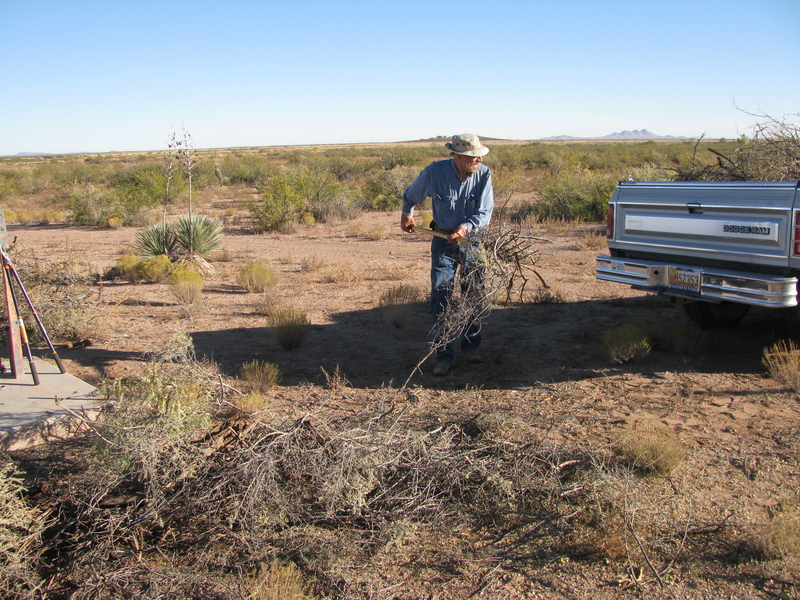 Ric Lambart pitching Mesquite cuttings into truck for removal from site. Photo by Sheila. L to R: Don Farber chats with Ric Lambart during break . . . Photo by Sheila. 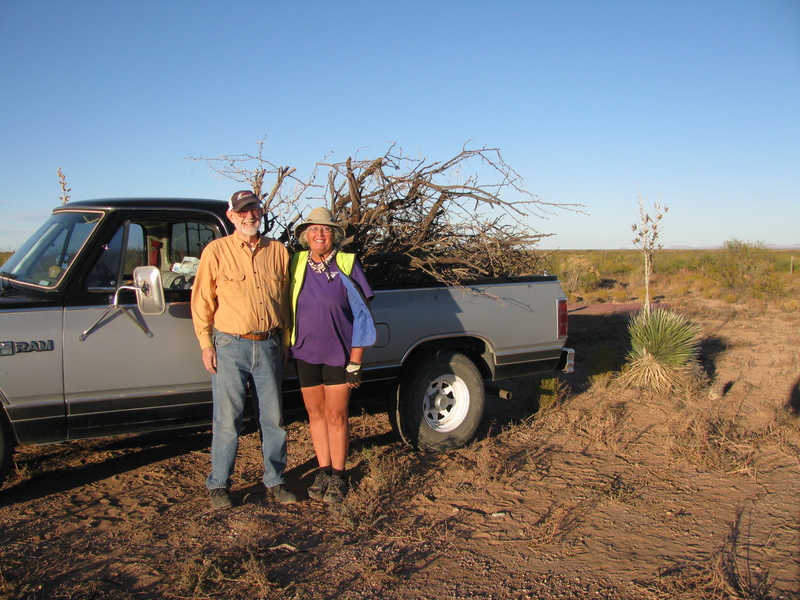 Don Farber and Sheila Bjeletich proudly pose by 1st truckload of Mesquite cuttings. 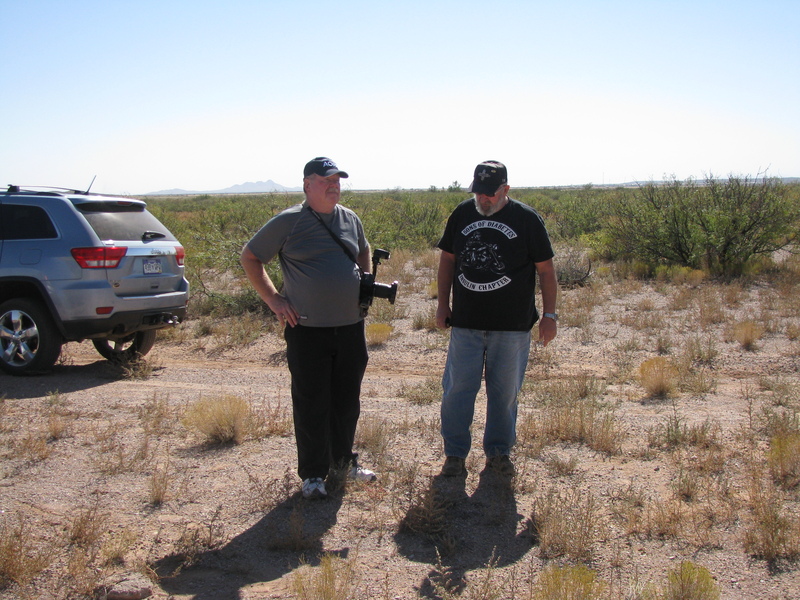 On another work day, Mike Florey (L) is seen talking with Bob Wright (R). 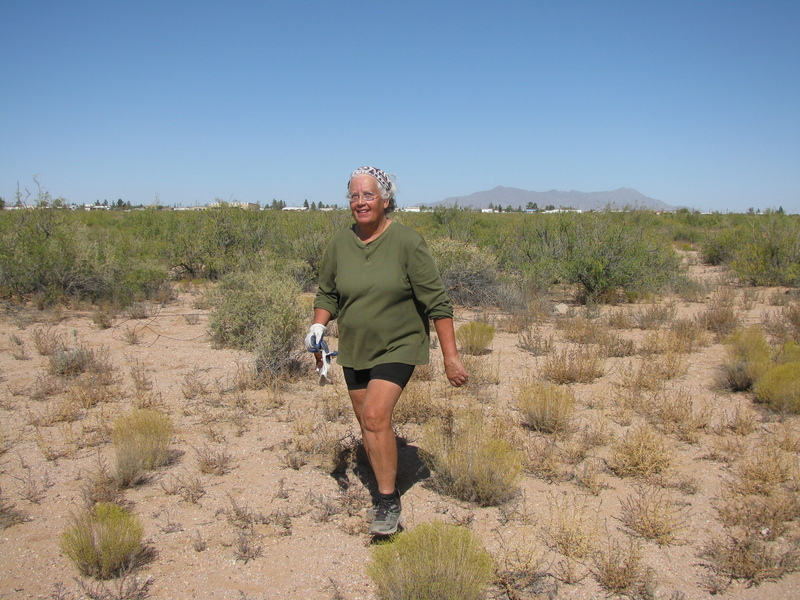 Sheila walks from one part of project to another part of cleanup and artifact discovery enterprise. 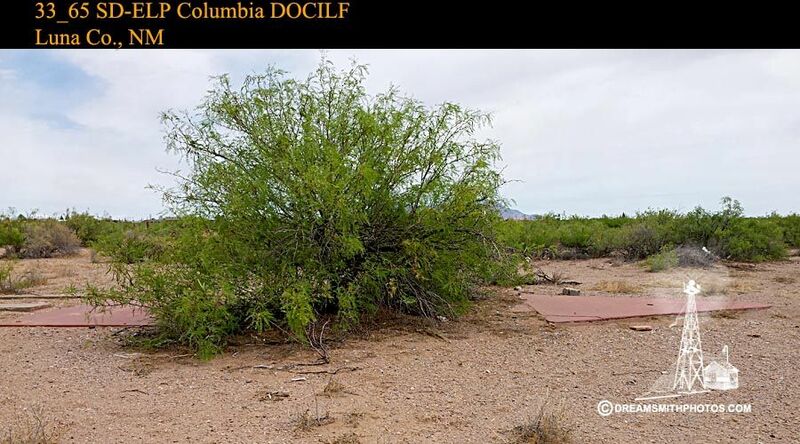 Sheila investigating the Mesquite overgrowth around some of the old “COLAIR” (Columbus Airport’s Name after WWII) landing field border markers, which still remain on the Airfield, but which will also need a great deal of cleanup work during their restoration. 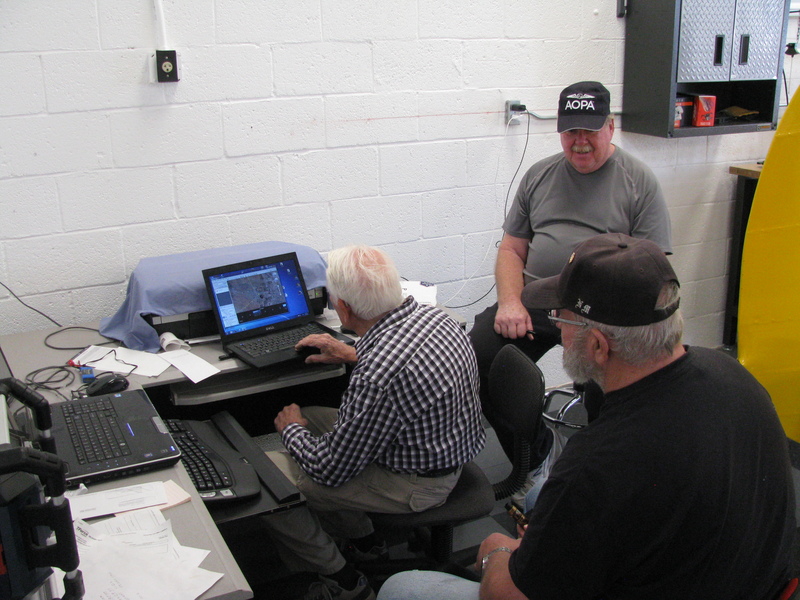 L to R above: Bill Madden working on his computer Airfield application in Mike Florey’s hangar, while Mike (at rear) talks with Bob Wright. Mike photograph’s Ric shooting video of the work in progress. 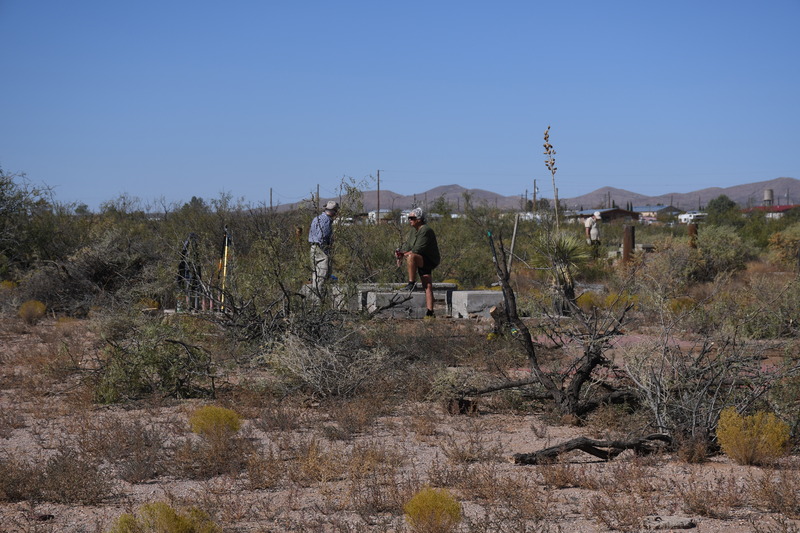 L to R: Ric Lambart and Bill Madden, watching Sheila Bjeletich dig up some old COLAIR artifacts. Photo by Mike. View of the now mostly uncovered US Airmail Directional Arrow. Photo by Mike. 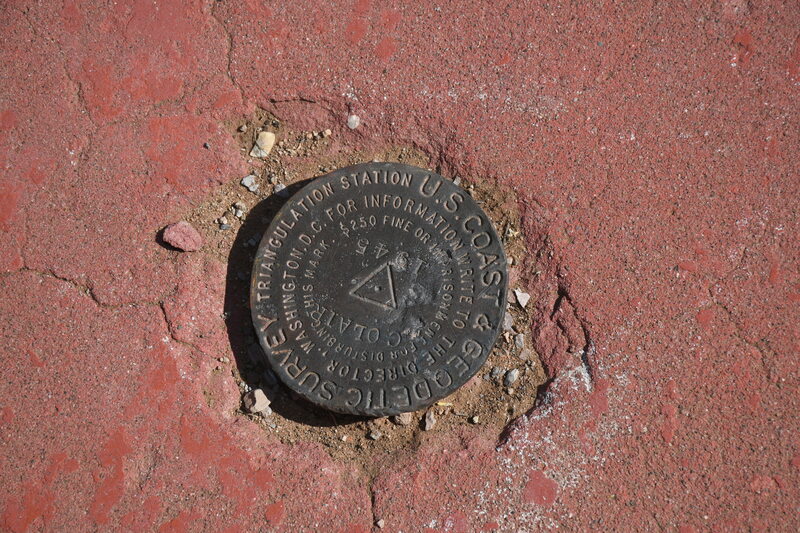 Mike’s closeup shot of the United States Coast and Geodetic Survey (USCGS) official seal/marker embedded in the concrete arrow. 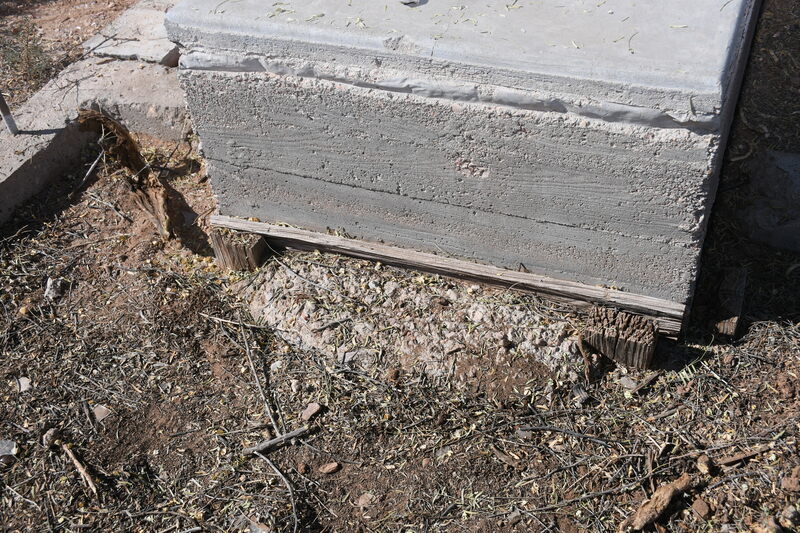 Close up photo by Mike of one of the many old concrete building foundation pads. 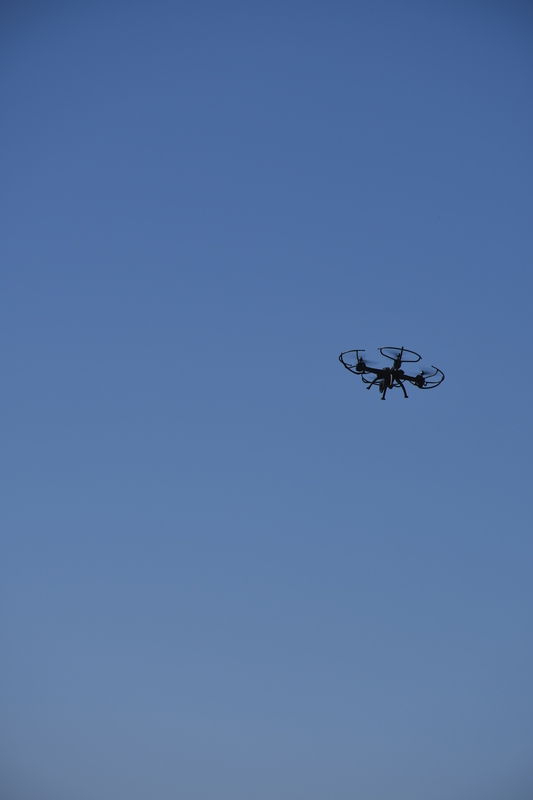 Mike’s photo of Bob Wright’s Drone in flight over Airfield. L to R above: Bill Madden, Sheila Bjeletich and Gordon Taylor. On any given work day there might be different volunteers doing the work . . . Photo by Mike. Bill Madden holds together two shards of the heavy glass lens that was once mounted in the Airway Beacon. Photo by Mike. 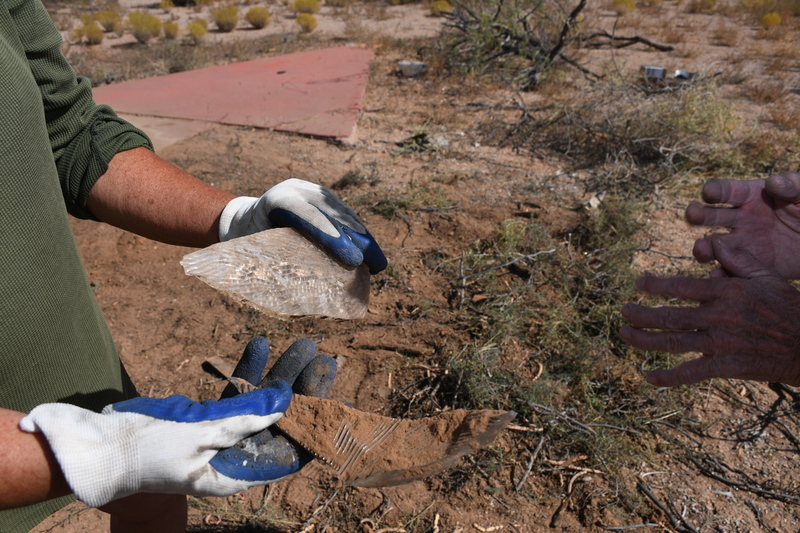 Sheila also found a number of the Beacon Light’s heavy glass lens fragments. Photo by Mike. 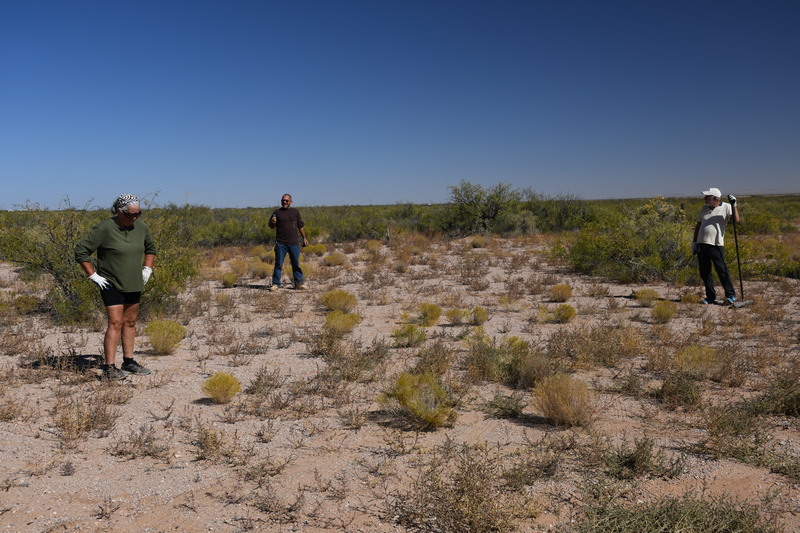 L to R: Sheila, Mario Escudero and Gordon Taylor surveying the next area that will need clearing. Mike’s photo. 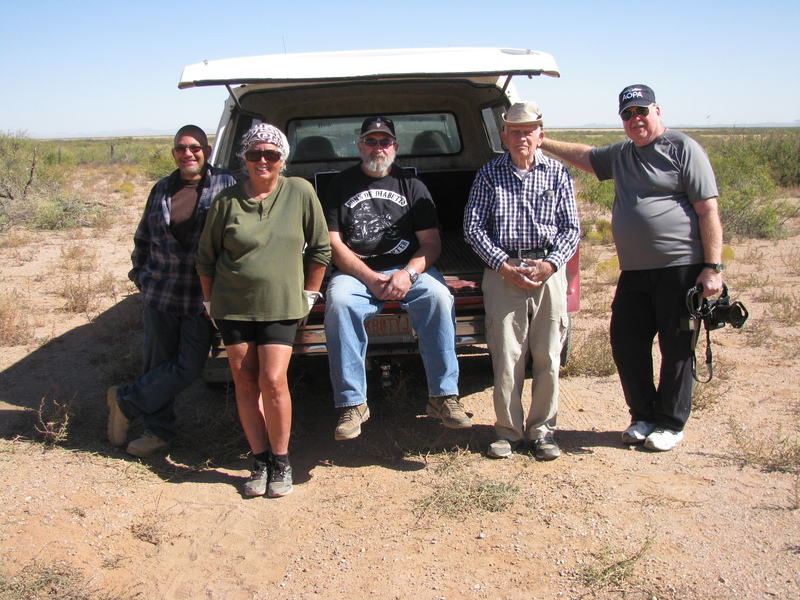 L to R above: Bob Wright, Bill Madden, Gordon Taylor, Sheila Bjeletich, Ric Lambart, and Mario Escudero. Photo by Mike. 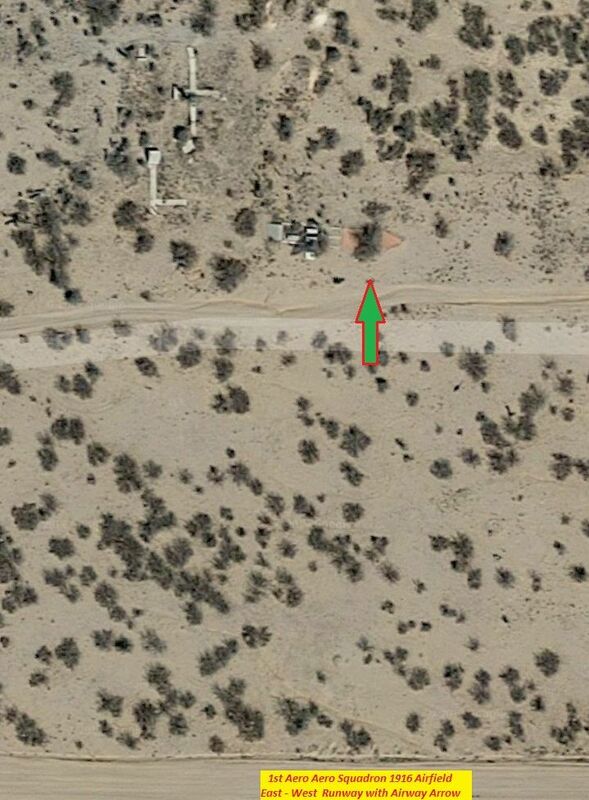 High altitude photo showing the Airway Marker Arrow (green arrow points to it), which is how it appeared before it was cleaned up and fully revealed as the result of this work project The main East-West Runway is at bottom of shot. 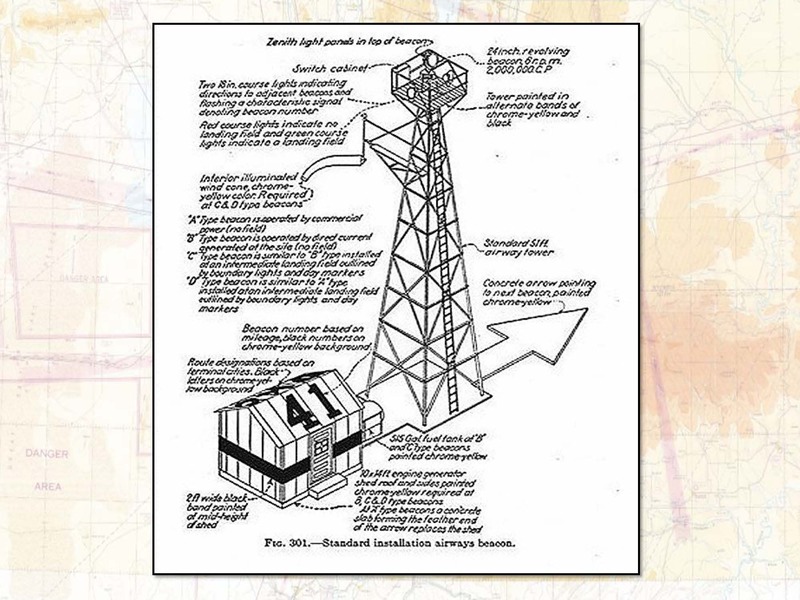 The above photo was taken by the couple, Paul and Charlotte Smith, who are behind the fascinating website entitled, “Arrows Across America.” Their site explains – and shows – how these arrows were used for navigation by the Contract Air Mail Pilots from 1927 until many of them dismantled. 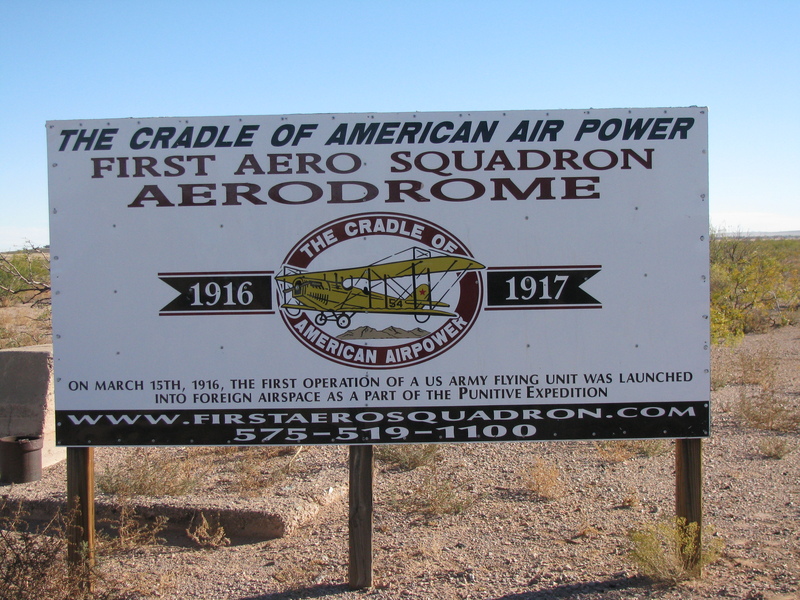 Visit their informative site (it’s preceding title is a link to their website) to learn more about the relatively brief period in time, before WWII, when the early airmail pilots used these concrete arrows to find their way to their next destination along their route. We thank the Smiths for permission to use this photo. The above (8:16) video, taken by Ric Lambart, was made during work sessions on this Cleanup Project. 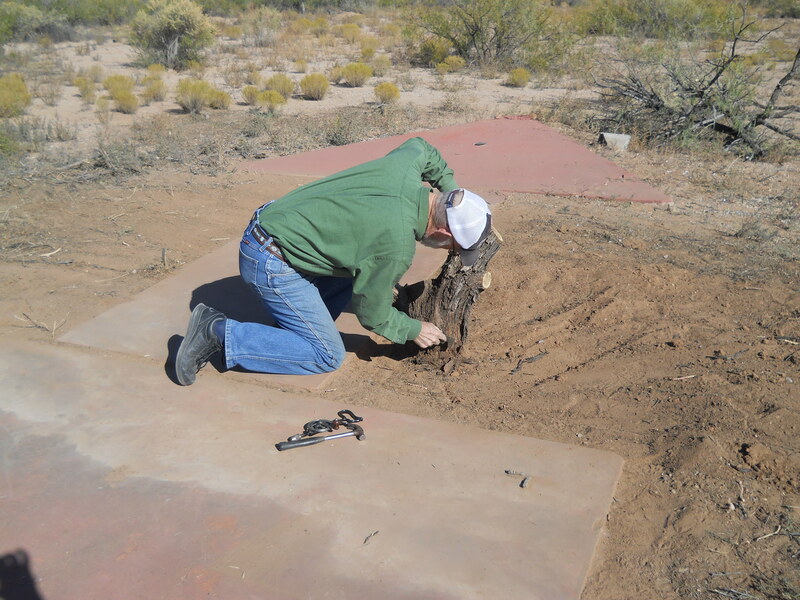 Don Farber using his unusual non-toxic technique for killing the deeply rooted old Mesquite stumps. 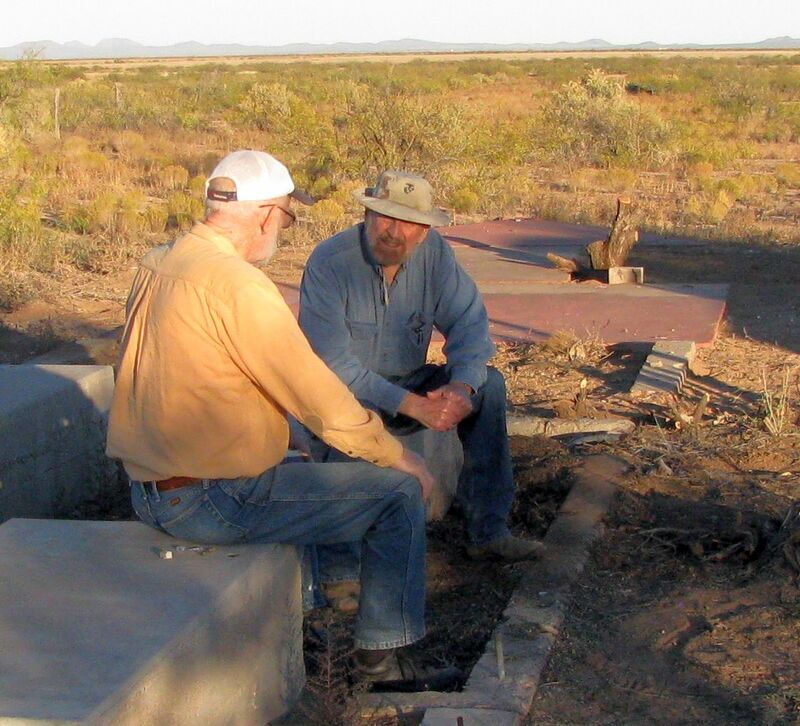 He uses only a set of homemade Copper nails, which he drives into the remaining Mesquite stumps. This entry was posted in AVIATION NEWS, HOT NEWS! on December 27, 2017 by FASFRIC. Your restoration project is looking good, glad to see the clearing work in progress. It’s been a long time coming. Is Hachita next?? Note, your article includes a photo of our Airways Museum at Grants Airport (GNT), but without a credit or location. Visitors welcome on Saturdays 9 to 1. . . . Jim Davis attended our dedication in 2012 and has enhanced our exhibits here. . .